There are many types of hedging that all require different treatment at various times of the year. At Malfords, we can advise on the right treatment for your hedging and ensure your garden/grounds look good all year round. Any type of hedge that is left unattended will over time leave the hedge with bare patches making it look unsightly. Malfords hedge services carried out at the right times of year based on the hedge type, will keep it looking at it’s best. Regular hedge maintenance promotes new growth, better air circulation and will make the hedge more resistant to disease. No matter how out of control your hedges have become, we can provide the right method of management to get them looking like a hedge once more. The UK is renowned across the world for its rich and varied patterns of hedgerows and are part of our cultural and landscape heritage. Our hedgerows are not just a boundary marker, they are a bio diverse environment that provides a home for small mammals, birds, butterflies, insects and other smaller plants. Any work carried out on hedges by Malfords will be sympathetic to the surroundings and the environment around them. Hedge material that arises from hedge trimming and reductions can be taken away to a registered waste transfer station. To help you decide the best time of year to call us out to manage your hedges, we have out together a guide of the most popular types of hedging and how often they will need pruning. 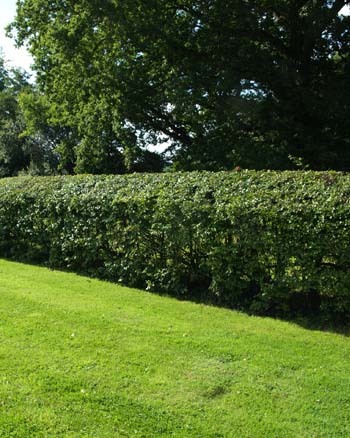 If you are unsure exactly what your hedges consist of, just give us a call and we will be happy to help you decide when you need our services. To prevent these fast growing evergreens getting out of hand they need a twice a year trim in spring and summer. The above hedging will benefit from a trim two to three times during the growing season. Your Hawthorne hedge will require attention in spring and autumn. If the Hawthorne has been neglected for many years, it will require more drastic pruning and maybe even re-laying to ensure new growth. These pretty informal hedges require a once a year tidy up usually after they have finished flowering. For any Hedgeworks query, please feel free to call us on 0115 963 3262.